South Australian Wholesale Nurseries. Advanced Trees and Landscaping Supplies for Adelaide and SA. Wholesale deciduous and evergreen trees. Wholesale roses, trees, advanced trees, perennials, palms and shrubs. Wholesale plant nurseries located in South Australia or supplying South Australian Growers and Nurseries. 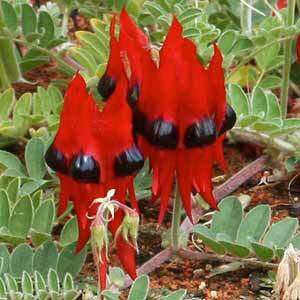 Swainsona formosa, the floral emblem of South Australia just one of the many plants grown and offered for sale. A number of interstate nurseries supply directly to South Australia, either through distributors or directly to nurseries, developers and landscapers. Quantities may apply. Supplying wholesale landscaping plants to the Limestone Coast/South East SA Region. Waikerie Native Wholesale Nursery specialises in large scale plantings of native trees in both cell and tube stock. Native trees can be grown to your specific order. Owners of Australian Rights to popular and versatile popular tree ferns “Kalgoorlie Gold”, “Emerald Beauty” and “Aztec Gold”. Also shrubs and potted colour.